Honda is always at the height of innovation, and that's evident with the automaker's innovative Honda Sensing® technology. 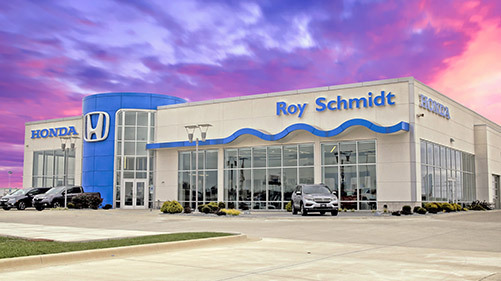 Find Honda Sensing equipped vehicles here at Roy Schmidt Honda. Lane Keeping Assist System (LKAS) helps you stay in line on the highway by adjusting your steering accordingly. Honda's intelligent Adaptive Cruise Control (ACC) makes road trips even easier. Instead of turning cruise control on and off, or switching lanes to keep it going, ACC automatically adjusts to the speed of those in front of you. If you start drifting into other lanes without using your signal, the Road Departure Mitigation System (RDM) will detect the movement and help you out by adjusting both your steering and braking to make sure you stay on the road. This system has your back when it comes to possible collisions. It watches out for other cars and objects on the road and applies the brakes if it senses that a collision is about to happen. Aside from these assistance systems, Honda Sensing also comes with warning systems, such as Lane Departure Warning and Forward Collision Warning. Both of these technologies work by audibly alerting you when you're unintentionally drifting from your lane or if a front collision might be imminent. Cross Traffic Monitor uses a Multi-Angle Rearview Camera to alert you when vehicles are approaching from the sides of your car. Honda Sensing® also includes features that give you greater perspective of your surroundings, such as the Blind Spot Information System (BSI). This system keeps you updated and aware of vehicles that ride in your blind spot by displaying an indicator on your car's side mirror. Auto High-Beam Headlights switch between low and high beams in order to help you navigate the road more safely. Plus, Honda LaneWatchTM gives you a better view when changing lanes thanks to an attached camera that streams live video on your Display Audio Touch-Screen.